Things that are misunderstood can be harmful; anything that isn’t properly understood can never be really beneficial, only harmful, both for us and for other people, for those associated with us. When we don’t understand anything properly it has no benefit, we can’t make proper use of it, it gets forcibly misused and the results are detrimental. We need to understand everything we’re concerned with properly so that, whatever it is, it can be beneficial. Misunderstand anything, misuse it, and from the misuse come harmful effects - no matter what it is: household articles, personal things, if we use them wrongly they can be harmful; if we use them properly they’re useful. There’s harm for others because we’re all connected, we can’t live alone, we’re connected sometimes out of necessity, that is, in matters that we may have to help each other accomplish or be collectively responsible for, like family affairs, where, if there’s misunderstanding, togetherness disappears to be replaced by arguments, by disputes - even with national matters, which are of great import, if people in a country understand anything wrongly, or in a contrary manner then it has the result we see, that is, there’s no real peace. An apposite example occurs in the problems associated with the concepts ‘world’ and ‘Dhamma.’ It’s generally said that if one wants the Dhamma, or nibbāna, wants the quenching of suffering, then it’s first necessary that we abandon the world. This is people without knowledge talking about things they don’t really understand. Everyone, all those beginning to study, even children should understand these words ‘world’ and ‘Dhamma’ properly and not just believe what people say when they tell us that we have to abandon one in order to achieve the other, who tell us that to quench suffering completely we must forsake the world, because, if we did that then where would we live? At present there are two languages in use: the language of worldly people who don’t understand things yet so use ‘worldly’ language, and the language of those who know the Dhamma, who have some understanding and use words in a deeper way, who use ‘Dhamma’ language. Each uses language on their own level and sometimes the same words and phrases can have almost opposite meanings. Worldly language when it describes the ‘world’ means this earth, this physical world, the world we live in, but in the language of Dhamma ‘world’ refers to a mental level, to the mind still on a low, a base level. One language describes the planet, the other the mental world of someone still dwelling on a low level. From now on we’ll be using Dhamma language, so ‘world’ will imply the mental level of someone still base, while ‘Dhamma’ will indicate an elevated mind, something which can help people to transcend, to dwell ‘above’ the world. ‘Dhamma’ in worldly language would refer to the teaching of the Buddha, the paraphernalia of Buddhism, the books, the scriptures, the triple basket of discourses, the Dhamma talks, or whatever. If it’s the deep language the Buddha used then ‘world’ implied suffering: dukkha, suffering is the ‘world,’ the cause of suffering is the cause of the ‘world,’ the quenching of suffering is the quenching of the ‘world,’ and the way to attain the quenching of suffering is the way to attain the quenching of the ‘world’ - the four noble truths. Referring to dukkha or suffering as the ‘world’ means the mind still on a low level and going wrong all the time, which is really the same thing as suffering, so if it’s said that the ‘world’ is suffering it’s Dhamma language and indicates a low-level mind. Ordinarily the world, this earth isn’t dukkha or sukha, it can’t be said to be either, so if we declare the world to be dukkha it means the mind of a being operating on a low level, moving under the power of avijjā, ignorance, and full of suffering. ‘The world is suffering’ has this kind of meaning. Dhamma is the opposite of suffering, it’s that which can quench it, put an end to it. If, however, the world is to be free from suffering, if it’s to be quenched then it must happen in the place where suffering happens, and because suffering happens in the world then the Dhamma that will quench it must do so in the world too. The two can’t be apart. So, if anyone doesn’t know where the world is, or where suffering is to be found then they won’t know where to quench either. Know that the ‘world,’ that suffering is in the mind, the world enters and dwells in the mind which is low, without knowledge. The low mind must always suffer - that’s called ‘world.’ Suffering dwells there, in that sort of mind, the spinning around in the mass of dukkha, the great whirlpool of all suffering is in the mind. We’ll have to quench suffering at suffering, at the ‘world,’ and ‘world’ in this meaning is a matter of the still ignorant mind, the mind not interested in Dhamma. Now, if this world is to be free from suffering it will be because it has the Dhamma; the two can’t be apart, can’t be two different matters in different places: if we want peace and happiness, if we want the quenching of suffering, then it will happen because the world has the Dhamma instead. Looking particularly at the world: something that arises according to nature but without knowledge is called ‘world.’ People when they’re born into the world are without knowledge of what they are, without the knowledge they need to have concerning themselves. If they know anything they’ll know that they’ve been born. People are born into the midst of ignorance, ignorance of themselves, so they dwell stuck, sunk in the world. Now, we - are we like this? Take a look and see. If we’re still blind, still ignorant, without knowledge of anything as it really is, then we are – we’ve been born into the world and we’re dwelling blindly in it, living blindly in the mass of suffering. If we suffer it means that we’re still blind to the Dhamma, that we don’t know the truth of anything, hence we oscillate, we swing back and forth between happiness and unhappiness, between laughter and tears, we’re someone who doesn’t know what the world is or what life is all about. If we enjoy living like this then we’re going to be mentally up and down, up and down, up and down, and all of the time. If, however, we feel that we don’t want that any more then we’re going to have to begin forming a new understanding, a new way of life so that we don’t have to continually swing back and forth between laughter and tears, between being happy or sad. So, that which is called ‘world’ is born into the world in accordance with the law of nature, but blindly, without knowledge, born in ignorance – which then increases, that is, people become more ignorant as they find delight in and become infatuated with the things they experience. In the mother’s womb there’s no infatuation because the infant isn’t experiencing anything that can delight it, but once born it will be fed, it will drink milk, hear sweet sounds, see beautiful things and so on, and will fall into delighting in those experiences. The infant meets with and feels liking for the pleasant, it gets ‘sucked in’ by the things it likes, it goes into, it ‘sinks’ into the ‘world,’ becomes a worldling obsessed with worldly things - enslaved, it delights in them so that if it’s given anything else it’s not interested but wants only the sensually delightful. This is to become worldly, to sink into the world, into the delightful, into the various forms of fun and happiness we derive from the things around us. This is the worldling. How many such people are there? Think about it. Who isn’t like this? If we aren’t we can be sure it’s because we aren’t stuck on the delightful, aren’t stuck on the ‘fun’ things we see, hear, etc. If we’re really free of all that then we won’t be worldlings infatuated with the world we experience. But, right now, through being unaware of what’s really what we’ll probably be ‘sunk’ in the world of sensual delights. When we emerge from the womb we aren’t like that, we’ve yet to become infatuated because we’ve yet to receive sights, sounds, smells, and so on, but in no long time, as the senses receive impressions, then, if anything delicious, delightful is involved it will cause feelings of satisfaction, there’ll be clinging to it as ‘mine,’ and there’ll be a ‘me’ growing up in the mind. Right here is a deep truth: it’s the desire for the delight, the satisfaction in any experience that gives rise to the feeling of ‘me,’ the feeling of being the ‘desirer,’ of the ‘me’ who experiences the delight and satisfaction. The ‘me’ arises after the ‘mine,’ which is normal. When we feel satisfaction in anything that’s the arising of the ‘world’ right there; it’s then that we become worldlings. The mind sinking into those things is said to have ‘sunk’ in the world. This is Dhamma language, so when we say ‘sink in the world’ we don’t mean sink into the ground in the same way that Devadatta (the Buddha’s relative, the one who tried to put an end to him) sank into the earth, rather we mean the mind sinking into ignorance, into infatuation with the delicious, into clinging to the forms, sounds, smells, tastes, touches, and mental objects being experienced. Thus, if something is likeable, satisfying we ‘sink’ into liking, into satisfaction, if it’s the opposite we ‘sink’ into anger, into dissatisfaction, annoyance. Someone sunk in the world will laugh, will cry, will be pleased, displeased, and so on. Anyone who’s like this ought to know it for themselves. What’s most dangerous about this is that we’ll become so delighted with this world we’ve sunk into, so infatuated with it that we won’t be able to see anything as being better - because we’re infatuated, then the things that we’re infatuated with are, for us, the ‘good.’ This is where we need to mention the concepts of ‘good’ and ‘bad.’ People addicted to cigarettes or to alcohol see such things as ‘good’ and don’t listen when we talk about giving them up, throwing them away. They don’t see any ‘good’ in that. Cigarettes and alcohol are, for them, amongst the most enjoyable of things. However, we should be aware that the forms, sounds, smells, tastes, touches and mental objects that we meet with through the eyes, ears, nose, tongue, body and mind are things more addictive than cigarettes and alcohol, but because they don’t reveal the associated problems directly, because nobody dislikes them, and because they’re all-pervasive people become infatuated with them. But be aware that these things actually torture the minds of those who find delight in them. The pretty sights, the sweet sounds, the delightful smells, the delicious tastes, the soft and gentle touches, the sensations, the pleasant thoughts, all these enslave the mind to pleasure, we’re pleased every time that we get them, but when we don’t get, when we get the opposite, we feel uncomfortable, irritated, disappointed, even angry. People who live in the world, who sink in the world display just these traits, these two kinds of behaviour: now happy, now unhappy, now it’s laughter, now tears. How enjoyable is that? Think about it. If we weren’t like that wouldn’t it be better? It’s the misfortune of children to be without knowledge when they come from the womb, so it’s inevitable that when the child meets with the delicious it will fall into liking, when it meets the opposite it will dislike. If children had the right kind of knowledge they wouldn’t do that, if they knew from birth that things are ‘just like that,’ are just what they are according to their nature, that depending on them the nervous system produces feelings, and that some things touch the nervous system and produce pleasant, some produce unpleasant sensations, but that’s all that happens - there’s nothing more than that. For ease of understanding take the experiences of ‘bitter’ and the ‘sweet.’ One feeling is called ‘sweet,’ another ‘bitter.’ Now, the nervous system feels them as they are, according to their nature, but we don’t, so we fall in love with the sweet and into aversion for the bitter. Then we’re mentally up and down, up and down, up and down - which is a kind of madness, one kind of madness: we stray into happiness, into unhappiness, into anger, into love, into fear, into anxiety, into jealousy and so on because we don’t understand these things properly, and, if it all gets to be too much there’s nervous disease, insanity, and sometimes people even kill themselves, drown themselves because of their infatuation with worldly things. So, if we understood these things in such a way that we didn’t make any mistakes when we had to deal with them wouldn’t that be better? It would be beneficial, it would be fortunate for us if we could avoid laughter and tears. Laughter is wearisome, tiring, if you don’t believe this then try it and see - try to laugh for just half an hour and you’ll probably drop dead. Not having to experience either would be better, then there’d be freedom, the freedom of a life lived beyond the things that cause laughter and tears, above the things that cause us to be pleased or disappointed. Then we’d live normally in the true sense. That would be better. But, if we wouldn’t like to be normal, to be above happiness and unhappiness, then there’s nothing for us to talk about. That’s our choice. The aim of the Dhamma is to help us to live above the power of the things that can cause laughter and tears, until we reach the point where we’re no longer affected by them at all. If anyone doesn’t like the thought of this because they see it as not being ‘fun’ then the Dhamma has nothing to offer them. To still like laughter, ‘fun,’ to like lots of laughter and tears isn’t anything to do with Dhamma. People say that they want to study the Dhamma, to know the Dhamma, to study it more and more, but we’re afraid that in some cases they won’t really feel a strong enough need, because if someone still likes to laugh and cry then they aren’t ready yet. The Dhamma is all about helping people to rise above laughter and tears, so, do we really want this - do we really want to be above the things that make us laugh and cry? Only in the world of the mind can we find those kind of things. The Dhamma will help us to rise above them - but, if we don’t like the thought of that then there’s nothing to talk about, if we do then there is. This is the world. the ‘world’ that’s full of the things that can make us happy or sad, that can make us laugh or cry, can make us spin around in suffering. Now, the second thing is the ‘Dhamma.’ ‘Dhamma,’ here, is the opposite of the ‘world’ and represents the mind which is awake. ‘World’ represents the mind without real knowledge, which is asleep, so to speak. We’re all worldly people sunk in the world, all except for those elevated beings the arahants, the Buddhas, who dwell above it, and teach about dwelling above it. But we’re sunk in the world, stuck with happiness and suffering. Dhamma represents the mind which isn’t that way, mind that knows the world as it really is, knows the things that cause happiness and unhappiness as being ‘just like that’ so that it doesn’t fall for them and instead goes along in the right way. ereHereIn the Pali language the word ‘Dhamma’ means all things without exception. Up to now we’ve been dealing with the part which is the enemy, hence ‘world’ is one meaning of Dhamma, a dhamma on the side of ignorance, of wrongness. In opposition to that are those dhammas on the side of illumination, of awakening, of knowledge. Dhamma is wide in meaning, anything and everything is a dhamma, but get to know the dhammas of the dark side so that we can avoid going wrong, come to know the worldly dhammas so that we can avoid sinking into the world. Get acquainted with all dhammas, no matter what they are or what their meaning is, so that we can learn to deal with them properly: know the worldly dhammas and know those that lead us out from the world, out from suffering, then we’ll always be able to quench that problem no matter how it manifests. In this way the Dhamma we study won’t be wasted. If we know the bad then that helps us to avoid it, knowing suffering we can avoid doing the things that cause it. If we study the Dhamma we study the truth that will help us dwell above suffering, but it shouldn’t be just an intellectual exercise - it’s not about studying so that we can answer questions or score points, that would be too little, not nearly enough. If we know the Dhamma we can control ourselves, control the mind, cause it to dwell in the Dhamma way so that there’s no suffering, no need to laugh or cry anymore. Dhamma is necessary for people living in the world. Humankind is sunk in the world and full of suffering, the Dhamma is that which will help us to escape from that predicament – just behave properly towards the things of the world and there won’t be any problems, that’s Dhamma. Anyone studying the Dhamma should do so to get this benefit. All people should study the Dhamma so that they know how to dwell above suffering, how to avoid being worldlings sunk in the world, sunk in suffering, and to become human beings dwelling above it instead. However, we’ll have to get to know suffering before we can begin to like the Dhamma; if we don’t know our own suffering yet the time hasn’t arrived for us to love the Dhamma. We have to know that which troubles and oppresses us so that we can turn towards its opposite. It must be suffering that teaches us about suffering. We’re going to have to find it sufficiently unbearable if we’re really going to be interested in doing anything about it. It’s then that there can be faith, belief in the Dhamma, in the Buddha, Dhamma, and the Sangha which, taken together, make up the system for the quenching of suffering. The Buddha tells us that we should take the Dhamma as our refuge, as our guiding light, and not to rely on anything else. But this we must see for ourselves - just as we must do what has to be done ourselves, no-one can do it for us, it’s a personal affair. Paccataṇveditabboviññuhi, means ‘to be experienced personally by those who know.’ We must do this ourselves: come to know for ourselves how it is that we sink into the world, sink into the mass of suffering; come to know within ourselves the desire to escape; come to experience faith in the Dhamma for ourselves, and then make the personal effort to practise and to come out safely. Thus the Buddha pointed out that one should take oneself as a refuge, have oneself as the guiding light and not take refuge in anything else. The Dhamma is a refuge, but we must realize it for ourselves, thus it’s said that we should take ourselves as a refuge, and we can achieve that through behaving Dhammically, through behaving correctly. So, now we know the Buddhist way: that we do things for ourselves, by ourselves until the result arises, until the quenching of suffering happens – that’s the Buddhist way. If we let ghosts and gods or whatever in to help then it’s the supernatural, it belongs to the supernatural and we won’t be able to understand anything as it really is. It’s taken for granted that to follow the formalities, to perform the ceremonies means that we’ll have good luck, that we’ll be happy, but this is superstition - superstitious belief which will have some result, some small and temporary result. If it’s going to be Buddhadhamma then we’re going to have to see clearly that suffering arises from our ignorance, from our being deceived into liking and disliking, into being made happy or unhappy by the many and various things we encounter. We can then arrive at the knowledge that whatever we experience is ‘just like that,’ the loving and hating can stop and there can be normalcy, the absence of suffering. Seeing clearly in this way at all times is Buddhadhamma. We need to study the Dhamma and practise to receive the fruits of our studies, to avoid the supernatural, the superstitious. A student of Dhamma who practises in the hope of getting a result goes the way of superstition, so, come back, hurry, turn around, come back to the Buddhist religion, otherwise we’ll wander aimlessly in the realms of the superstitious. Understand that since birth we’ve had to depend on other people for our guidance, on people who don’t understand the way things really are themselves. We’ve received the sort of teaching that’s been essentially supposition from the time we were born. But now that’s out of time; we have to understand the problem itself; we need to understand ourselves, understand our minds to see how suffering arises, where its roots are, and then go about destroying them. In this way our own actions will become the ‘devas’ that help us, the ‘god’ that gives us assistance. We help ourselves to quench suffering, dukkha. This is the meaning of having oneself as a refuge. So, hurry up, go to it, do the right thing! That we did wrong before? Never mind that now because then we didn’t realize, didn’t know that we were doing wrong, so it can, in a sense, be forgiven. But from now on if we go wrong again we know we’ll get the reward: laughter and tears - now laughing, now crying, now happy, now sad until we become really insane. Why let that happen? Stop making mistakes and do what’s right, be correct, from this time on don’t let anything delight the mind or make it angry, make it like or dislike, make it be afraid, or whatever, then we’ll have put things right through our own efforts, then we can look on our actions as being the devas, the god, as that something holy, something sacred that comes along to help us. Thus we meet with success through our own efforts. This is Dhamma. As for ignorance? That’s the world – worldlings sunk in superstition, unable to know anything correctly, even the world they’re sunk in. We can compare this with, for instance, a bird that doesn’t see the sky it flies in: people in former times had a saying that birds don’t see the sky, although they fly in it and their eyes are open still they don’t see the sky; the fish doesn’t see the water even though it swims in it and the water is always right in front of its eyes; the worm doesn’t see the dung it lives in; the earthworm doesn’t see the earth it moves through, that it eats, and so on. Thus it’s said that people live in, sink in the world but they don’t see it. Are we like this? Are children just born into the world like this? Are they the same as the birds and fishes? If we could see the world as it is then we’d be incapable of going wrong and wouldn’t have to suffer, rather we, dwelling always above the world, could mock at it, make fun of it. We could dwell above the world because we’d know the reality of it. If we can’t do that then we’re in much the same place as the bird that doesn’t see the sky, the fish that doesn’t see the water, and so on – we’re people who don’t see the world we live in. Now, if correct seeing should arise it would become a Dhamma matter. Dhamma is a matter of knowing, and, knowing the world as it really is one wouldn’t be inclined to sink into it. First people live with suffering, then they get the Dhamma as the Buddha taught it and as it continues to be taught, and knowing Dhamma they don’t sink in the world so don’t have the suffering of those who do. The Dhamma and the world can’t be apart, if so there are problems, don’t be foolish and talk about abandoning the world to go and live with the Dhamma, because it can’t be done, the physical part of us, the body, must live in the world, must be connected with it, must eat, and so on. Bring Dhamma into life to help sustain it, don’t let suffering happen, live in the world without having to sink into it, without having to suffer. We make the effort and study the Dhamma to get this kind of result - less suffering, or no suffering at all. Thus we get benefit, if we don’t then it’s not worth the time and effort. We should get the boon of a bright, clean, peaceful, clear mind so that life is cool, not dark, hot and full of laughter and tears. Hence, we don’t need to abandon the world to find the truth, and anyway we can’t do that because the body has to live in it, just don’t let the mind sink into the world, have Dhamma so that the mind doesn’t sink in the world even though we still have to live in it. That ‘world’ is the suffering arising through wrongdoing towards the various things we have to experience. The world, the actual world, the earth, and the multitude of things in it aren’t happiness or suffering, aren’t ‘good’ or ‘bad’ in themselves, but if we respond to them carelessly there’s immediate suffering; if we deal with them correctly they’re useful, we can use them for our benefit, as with possessions, as with money, property or whatever, we can use these in such a way that they don’t have to be dukkha, but if we’re ignorant and deal with them unwisely they will be. We need to know how to handle such things without letting the mind become infatuated, delighted with them. People without such knowledge live sunk in the world and have a lot of suffering, but we won’t be like that, won’t have to suffer to that extent, and, eventually, won’t have to suffer at all. When we want to do only what’s right there’s no suffering. Correctness is the dukkha-less. If we still have to suffer then we still aren’t operating correctly. And this ‘correctness’ is completely useful, without any bad effect, so everybody benefits. Thus, we live in the world usefully and everyone has the boon of being without suffering – that’s ‘correctness.’ That’s Dhamma. Now, it’s said that anyone who sees the Dhamma sees the Buddha too. The Buddha said as much. If we don’t see the Dhamma then hanging a Buddha image around our necks as a talisman isn’t going to do the job. But, as already mentioned, if we see the Dhamma then we know the truth, the truth that mankind sunk in the world, suffers, so, if we don’t sink into it, don’t misunderstand the happiness and unhappiness that’s in it then that won’t be the case. Seeing the truth of this one sees the Dhamma, and anyone who sees Dhamma to such an extent that they’re able to quench suffering for themselves is someone who sees the Buddha. Don’t think that the Buddha disappeared with his nibbāna, his death, cremation, and the distribution of his remaining bone relics. Ignorant people would think that way, but not those with knowledge, because the Buddha had already made it clear that the Dhammavināya he’d revealed would represent him once he was gone: the body of the Buddha would break up but he’d continue to exist in the form of the Dhamma, so he said that anyone who sees the Dhamma sees me. The Dhamma is dukkha and its quenching; really knowing this is called ‘seeing the Dhamma,’ and when one truly sees the Dhamma they see the Buddha too. It’s a sad fact that the Dhamma is within us but we don’t see it. We have suffering so we must have the Dhamma too; suffering and its quenching are within us, both are in the mind. This being so, take an interest in suffering, don’t just let it go on and on, don’t be careless, don’t be indifferent, whenever suffering is present take a close interest in it, be patient, see that it can be quenched - it’s then there can be satisfaction with the Dhamma. Seeing Dhamma in this way is to see the Buddha, to have the Buddha within us, not to just talk about it. Mostly it is just talk: Buddhaṇ, saranaṇ gacchāmi - we call the Buddha our refuge and yet we don’t really know ourselves or the Buddha properly, so it’s just words. We need to see our suffering and the Dhamma that can quench it - then we have the Buddha, the Dhamma, and the Sangha, then we are the Buddha, Dhamma, and Sangha. That would be the greatest good fortune, the best thing that a human being could get, that a Buddhist could have. We’re looking at the world and the Dhamma. The ‘world’ is an ignorant being sunk in the mass of suffering and unaware of it. Dhamma is the mind which is bright, clear, which has the knowledge and conduct necessary for the quenching of suffering. If this world doesn’t have Dhamma it’s a hell, if it does then it’s a world of peace and contentment. The world cannot be apart from the Dhamma, if Dhamma is removed from the world it comes to pieces and hasn’t any use or benefit. The world at large would have Dhamma if suffering people could conduct themselves properly - if they could behave in such a way that they didn’t let dukkha happen then there wouldn’t be any suffering in this world. At present everyone suffers to some extent, now laughing, now crying and so on, and the world isn’t an attractive proposition, it’s still a world of suffering, a world of beings sunk in dukkha. Living without having to experience dukkha means avoiding being sunk in the world. When anyone manages to do this they’re said to dwell ‘above’ it instead. There’s a word we ought to understand: ‘lokuttara,’ which is a Pali word and indicates a mind that’s elevated, that isn’t worldly, isn’t sunk in the world. Those beings called arahants dwell mentally above the world, aren’t sunk in it and don’t experience suffering. We too, sometimes, can dwell above the world, it’s not that we’re always ignorant and sunk in it, but sometimes, for perhaps a few minutes at a time, we know what’s happening, we can restrain the laughter and tears, the happiness and the unhappiness, and when that happens there’s a little freedom, a little lokuttara, just a sample - what we like to refer to as a taste of nibbāna, a taste of the ‘unconditioned.’ Whenever the mind is elevated, dwelling above the things that cause suffering, there’s clarity, and then it’s as if we dwell on a higher level from where we can look down on the ocean, on the swamp of suffering, which is an ugly, a fearsome thing. Those are the best, the most comfortable, the happiest of times, when the world doesn’t lure us into suffering. It’s important to realize that the world is full of ‘bait,’ full of things that can lure us into problems, but that it’s only when we’re foolish that we take the bait – it’s only then that we have problems. So, if we don’t let ourselves be foolish we can avoid doing the things that cause the problems. That’s the benefit of Dhamma; the grace of the Buddha is right there to help us, to keep us from sinking into suffering. So, having Dhamma we have the Buddha, having the Buddha we have the Dhamma. Get to know the Dhamma so necessary for the world so that we can come to know the way to dwell above suffering, because when we know that there’s something we can do about it then we might feel the desire to act. That’s the beginning of faith, the faith that we can defeat suffering and that it’s the Dhamma that will help us to do that, then we can practise in the sure knowledge that it’s going to be beneficial. If we don’t feel this way then there’s no belief, no faith, or rather there’s the sort of faith that might persuade us to go and see a particular movie, but when we do see clearly what life is like and that there is a way out from that, a way to dwell above suffering, then we can have faith in the Buddha, Dhamma, and the Sangha. It’s then, perhaps, that we might renounce in order to study the ways and means, and, more than that, ordain to have the necessary time for the Dhamma study and practice that will bring us closer and closer to the Buddha. These are the still misunderstood matters of the world and the Dhamma. It’s still claimed that one needs to abandon the world in order to attain Dhamma, to quench suffering, but to put an end to that problem what we really need to do is to manage the world correctly: if there’s suffering in life fix the part that’s the problem, don’t allow the causes of it to exist; be clever, get to know the causes of suffering. At present people aren’t much interested in doing that so they suffer, oscillating between laughter and tears until overtaken by nervous disease or insanity, or, if it’s worse than that and they’re at their wits end, some people might even kill themselves, take poison or jump into the water and drown. But we don’t need to do that, and anyway that would be shameful - if one knows the Dhamma then one knows how to control the mind, to change it in such a way that none of that needs to happen. 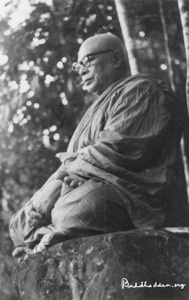 The Dhamma is thus a necessity for the world; the world must have Dhamma; humankind – we - must have Dhamma so that we can rise above the world and not sink into it, so that we don’t have to suffer. To sum up: we ought to live in such a way that we’re above the world - which sounds odd: live in the world but be above it’s influence, but remember it: live in the world, but be above the world, that is, don’t sink, keep the mind above the things that can cause happiness and unhappiness, that can cause suffering, then we can live in the world but be above its power, above its pressures. The body dwells in the world, and the mind dwells with the body, but the mind is above the pressures of the world, there’s no power in the world that can pressure this mind, make it happy or unhappy, make it give rise to greed, anger and delusion, because it has the Dhamma. The world and the Dhamma are connected in this way: dwelling in the world having conquered it’s influence, that’s Dhamma. The matter is at an end.